March is here and that means SPRING is in the air! 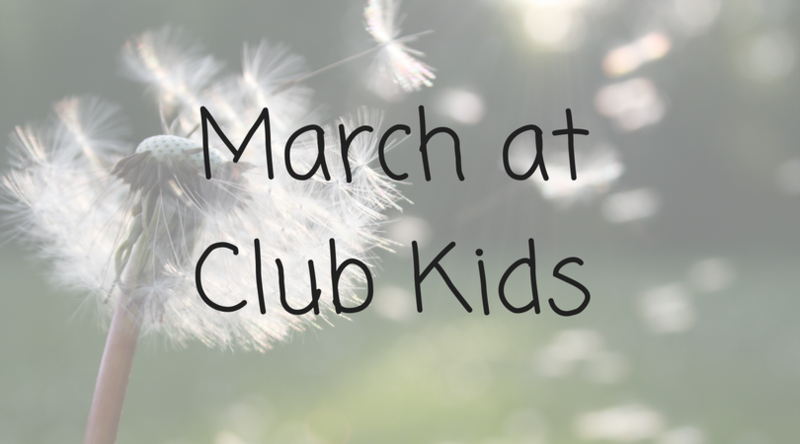 Club Kids has lots of exciting activities planned for this month to kick off spring. March 6-11: Join us the week of the 6-11 as we learn and explore weather. We will be making weather charts, talking about the differences in weather and learning what kind of weather we all like the best. March 13-17: The following week will be our St. Patrick’s Day fun week full of crafts for the holiday, silly exercises and books about St Patrick’s day. March 20-25: We will kick off the official start of spring the week of the 20-25 with spring crafts, sensory play and many more exciting things. March 27-31: We will wrap up the month with caterpillars and butterflies. There will be many neat crafts, books and we will learn how a caterpillar transforms to a butterfly. We are very excited to offer these new options for you and can’t wait to see you all!